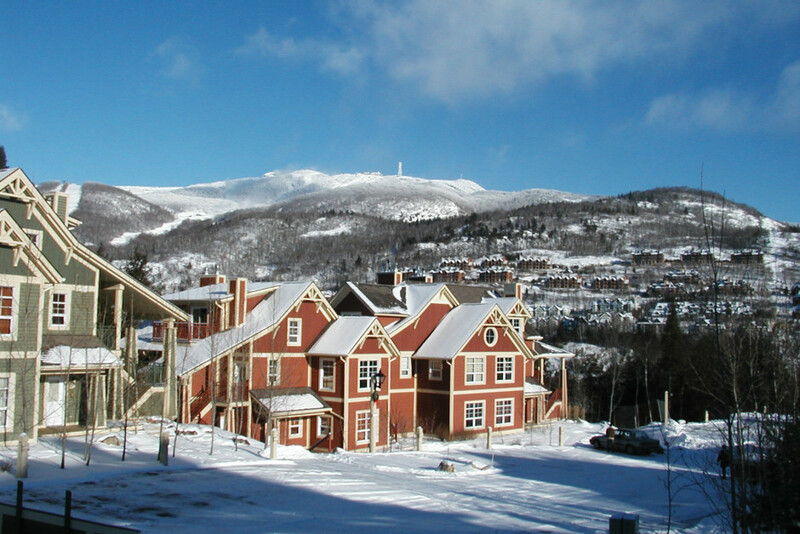 Tremblant Les Eaux is a high-end resort residence complex that’s located only steps away from the prestigious Le Géant golf course. Each unit is situated at an angle that offers occupants incredible, uninterrupted views of nature, the mountain and Tremblant Lake. Inspired by the European thermal spa experience, this complex offers guests two whirlpool baths, a heated pool and a training pool during the summer season. Guests can also relax in the hot tub, sauna and steam bath year-round. The charming pedestrian village is a 12-minute walk away, at the foot of the slopes, where vacationers can take part in a wide range of activities. A shuttle service also operates throughout the day. Each unit is equipped with a locker to store skis and other sports equipment. This is the perfect vacation residence to recharge! The two-bedroom, two-bathroom unit comfortably accommodates seven. In the warm, inviting ambiance, guests can cook and then enjoy a fine meal at the dining-room table. The master bedroom with ensuite bathroom is furnished with a king-size bed. The second bedroom has a double bed and a twin bed. 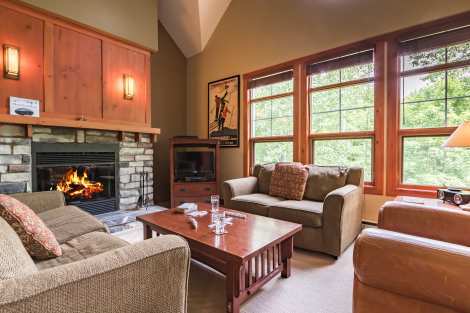 Adding to the guests’ comfort are the Finnish sauna,wood-burning fireplace, heated tile flooring, wireless access to high-speed internet, three flat-screen TVs, a DVD player and a compact sound system. In summer, the balcony with barbecue lets you spend even more time outside,surrounded by greenery. Beautiful 2nd floor corner condo on 2 levels. Private sauna, cathedral ceilings. Showers only. Freshly renovated! 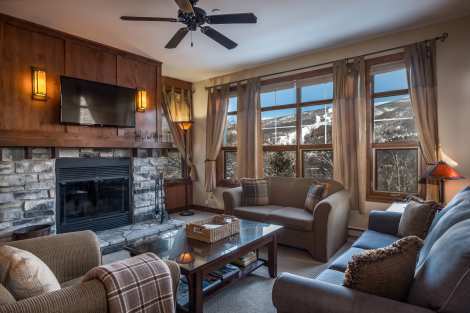 Beautiful condo located in the front row, just minutes away from the mountains and ski slopes. Space and luxury define this residence of two bedrooms, two dens and two bathrooms. 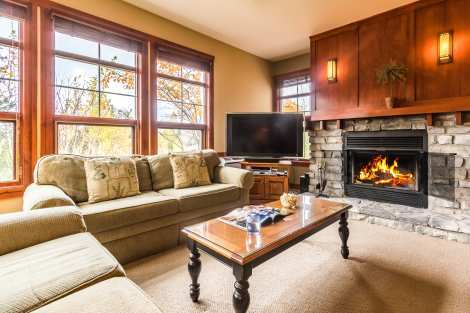 The nature’s view, brightness, heated floors in the kitchen and bathrooms and the cozy living room with its wood fireplace will fill you. The place is well equipped to cook gourmet meals, with a small kitchen with granite countertops all open to the main room. The master bedroom includes a wood fireplace, a TV and a full bath, perfect for a well-deserved rest. In the summer season, the air conditioning ensures a perfect room temperature at the return of the activities. Otherwise a pleasant break at the large pool complex awaits you. A flat-screen TV with cable, a DVD player and wireless high-speed Internet access will entertain the occupants should the need arise. Time will probably be the only missing item when you drop your suitcases in this property where every inch has been intelligently exploited to provide maximum comfort. 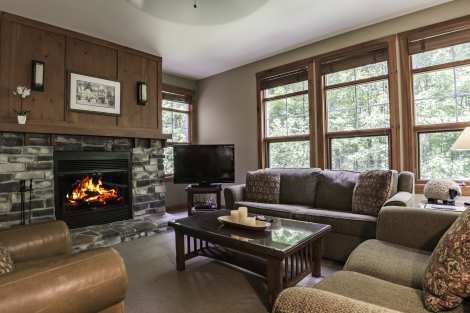 Multiply the benefits of a mountain vacation with an unforgettable stay at Tremblant-Les-Eaux. 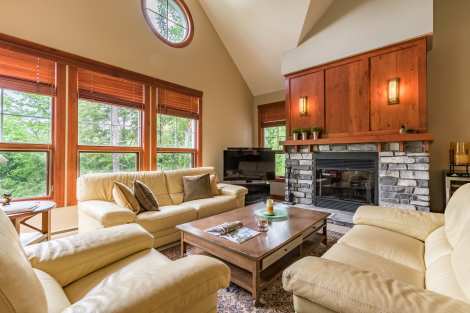 Located just beside Le Geant golf course, your mountain vacation home offers you relaxation and escape. With a sauna and all-season hot tub, you will find everything you need to unwind! Each unit is a corner unit, therefore spectacular views of the resort, golf course and the magnificently unfolding seasons are yours to enjoy year-round. Whether it be a romantic getaway for two or an escapade for the whole family, this dream destination promises to revitalize you! Property Bonus: Meets modern decor in this beautiful 2-bedroom unit, come and enjoy its charm. 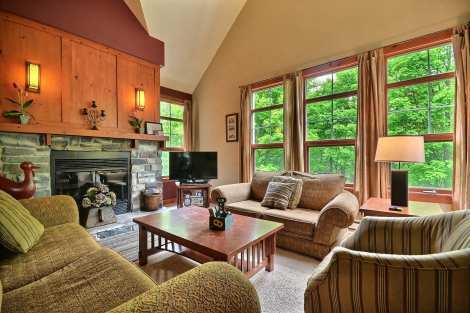 This wonderful vacation residence, with three bedrooms and two bathrooms, can accommodate eight people. This warm and inviting spot features a country-style décor and is equipped with a Finnish sauna, perfect for relaxing between outdoor activities. You’ll enjoy preparing meals in the well-appointed kitchen and gathering around the lovely dining table for a good meal. 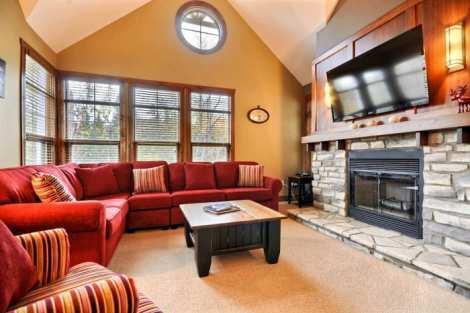 The living room is the perfect place to nestle in the leather sofas in front of the fireplace. The bedrooms are relaxing and the bathrooms have heated tiles. The spacious master suite occupies the second floor and includes a full bath and sauna. The unit is partially air conditioned and comes equipped with wireless access to high-speed internet, flat-screen HDTVs, DVD and Blu-ray players, and a surround-sound stereo system. This perfectly designed 1,200 square foot space is the ideal location for a memorable family holiday. This is the ideal place to recharge after a day of exhilarating activities in the snow or under a summer sun. This condo can comfortably accommodate a family of 10. The large master suite is air conditioned and furnished with a double bed and two twin beds, and includes a bathroom with a Finnish sauna and a sliding door that opens onto a balcony. The other two bedrooms are each equipped with a king-size bed, and one also has a balcony to savour some peaceful moments. Tile floors are heated. A lovely wood-burning fireplace livens up the living room. Among the conveniences offered to guests are two TVs, a DVD player, a compact sound system and high-speed internet access. 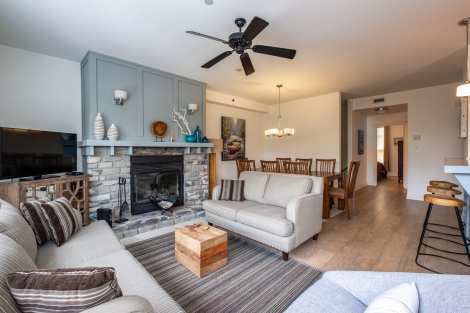 You’ll love this gorgeous three-bedroom, two-bathroom condo built over two storeys. It offers tons of space to gather family or friends. 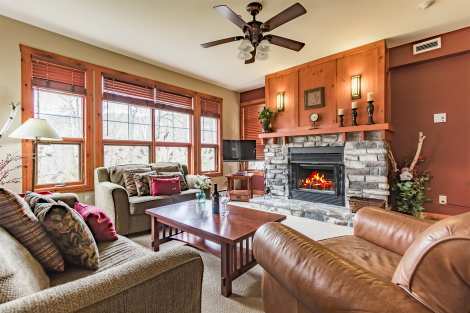 It’s bright and cheerful thanks to the generous window arrangement, and cozy thanks to the imposing wood-burning fireplace and heated tile flooring. The well-equipped, pleasant kitchen features granite counter tops and stainless steel appliances. The large master suite occupies the second floor and includes a luxurious bathroom, king-size bed and flat-screen TV. The other bedrooms are very comfortable and furnished with a queen-size bed in one, and two twin beds in the other, and both have a flat-screen TV. In summer, guests can enjoy the balcony with barbecue. Also included are high-speed internet access, as well as an HDTV and a Blu-ray player in the living room. This is my second time using this facility. Its fantastic and we will be back again next year. The only thing we don't seem to understand is why cant you use the outdoor bbq? Nice unit. Very comfortable and close to the village.